It’s finally beginning to feel like winter. We’ve been very lucky so far with mild temperatures, but this week we’ve seen minus temperatures, snow fall and plenty of ice on the roads. There’s more winter weather on the way, so it’s time to create some winter warmers to keep the family warm from the inside out. Here are 3 beef recipes that will help you stay cosy when the snow falls. A casserole is perfect for cold, snowy days. 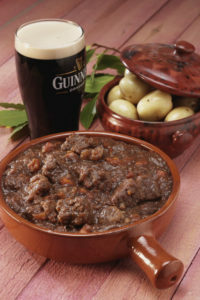 Come home to a house filled with delicious aromas and serve up dishes of tasty casserole filled with Hereford beef, carrots, chestnuts and stout gravy. Ask your butcher or visit the meat counter at your local supermarket and ask for 1kg of cubed Hereford braising steak. After browning off the beef, carrots and onions, stir in the flour, sugar, tomato puree, beer and seasoning before placing in a casserole dish and cooking for 2 hours in the oven. Find the recipe and full list of ingredients, here. Comfort food at it’s finest. The Teviotdale recipe is a much-loved recipe with Hereford beef fans. The recipe originates from the Borders region in Scotland. The minced Hereford beef works perfectly with the soft crust that tastes like a mix of Yorkshire puddings and suet crust. This is a filling dish that works beautifully with fresh vegetables on cold winter nights. Find the ingredients and the recipe, here. Avoid ordering takeout, cook a healthier Hereford beef curry and save a few pennies in the process. This is a rich and warming recipe calling for 800g of Hereford shin or brisket. Cut the beef into 4cm cubes and enjoy this fragrant and tasty recipe with rice. The Hereford beef curry is perfect for batch cooking as it also freezes beautifully. Find the ingredients and the recipe, here.